En la violencia concentrada en esa "nota insignificante" que desencadena el balido de una solitaria oveja descarriada, hay un aviso. Es una hipérbole apocalíptica del que vendrá. De lo que sucederá el día que, desaparecidos ya los dueños del rebaño, el protocolo timorato de los actos de masas no funcione como corral. marzo 27, 2012 11:12 a. m.
marzo 27, 2012 11:26 a. m.
Me parece que Ud. habla de estas cosas con cierto regocijo, somo si le deleitara presentarnos a un grupo de cubanos exiliados como castristas. Yo soy anti castrista. Por eso me fuí de mi país que amo mucho. marzo 27, 2012 12:48 p. m.
Cuban citizens all over the world feel outraged that the International Committee of the Red Cross (ICRC) has not yet denounced publicly the attack that took place yesterday in Santiago de Cuba, Cuba, prior to the mass that Pope Benedict XVI was to give in a public plaza of the above mentioned Cuban city. 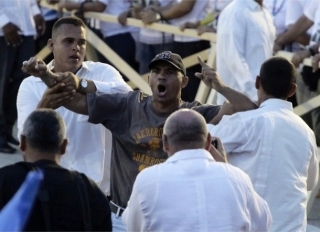 The attack was carried out—filmed and photographed by the international media: http://noticias.univision.com/edicion-nocturna/videos/video/2012-03-27/hombre-que-grito-en-cuba , http://youtu.be/cmD6BsHRAWM, Reuters, etc.—by a person wearing a Red Cross vest and carrying what appears to be a medical stretcher, and it was inflicted upon an unarmed Cuban citizen who simply protested that there are no civil liberties in his country, which the subsequent detention itself proves. After the protester was detained by police forces dressed in civilian clothes, abundant throughout the plaza, the “questionable” Red Cross worker attacked the detainee—who was visibly restrained and incapacitated to defend himself—, hitting him on the head with the stretcher after pushing him. The Cuban community feels that the ICRC owes the world an urgent explanation as to why a person wearing its iconic Red Cross of good will and human concern for others, would act in such a violent way against someone that was only exercising his freedom of expression, which we are fully aware the Cuban government violates and does not respect, but the International Committee of the Red Cross (ICRC) should indeed not only respect, but defend as the “neutral organization ensuring humanitarian protection and assistance for victims of war and armed violence” that it is. marzo 27, 2012 2:35 p. m.
Ano, no eres el primero en escandalizarte. Pero ¿anticastrismo no es ya una forma de castrismo? Sigue visitando. No lo tomes de manera personal. marzo 27, 2012 4:13 p. m.
marzo 27, 2012 9:02 p. m.
Me niego a aceptarlo. Es muy duro!!!! marzo 29, 2012 12:49 a. m.